I love tropical flavored cocktail drinks especially ones that contain pineapple, mango, guava and/or bananas. Heck...just toss in all of those flavors and I'm a very happy girl. When I make cocktails at home, I'm all about the quick and easy recipes. I don't have time to mess around whipping up the perfect drink, so I love recipes like the one that I'm featuring today here on the foodie blog. 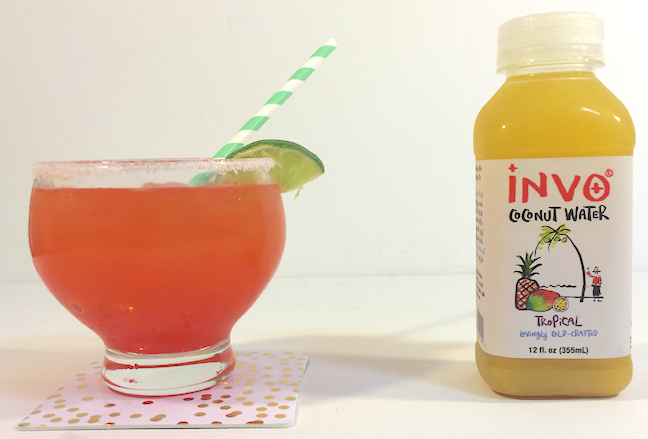 This recipe is courtesy of INVO Coconut Water. You can visit their website to learn more. They recommend garnishing with mint & a wedge of lime...I think I would use strawberries or pineapple, personally. It looks delicious and perfect for summer! Directions: Shake with ice and fresh squeezed lime juice. Pour into a rocks or highball glass. Garnish with mint and a wedge of lime. I have never heard of INVO Coconut water. This looks like a good refreshing drink for the summer.